✓ Encryption (RC4 with 40 and 128-bit key length, AES with 128 and 256-bit key length). ✓ Image formats: BMP, TIFF, JPEG, PNG. 1 bpp (black and white). ✓ TIFF format: multipage support, TIFF compression. ✓ Read documentation about the settings options. ✓ Encoding: ANSI, UTF-8 or Unicode. ✓ Text files in UTF-8 and Unicode can contain BOM (Byte Order Mark). ✓ Single page or multipage documents support. Please note that Virtual Printer Driver is not always able to extract text. For example, if you print a PDF document, Acrobat Reader can convert text into an image. You can test the printing to text yourself to see if it works is certain cases. 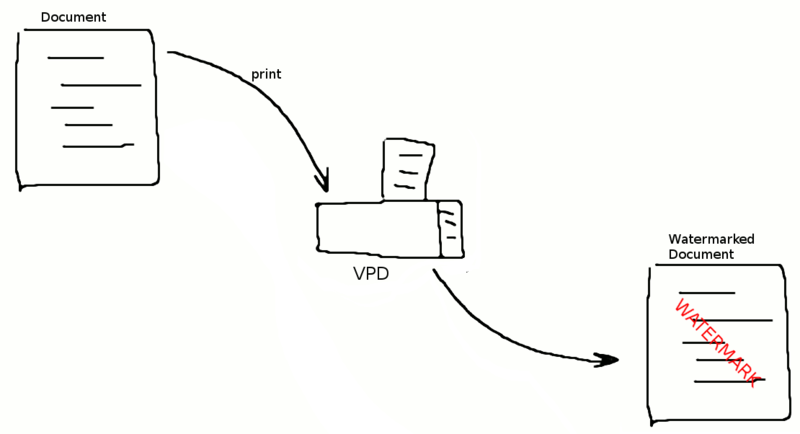 Using virtual printer as a print server you can archive printed documents with printing date and document owner. This solution can be used also to distribute printing volume to a set of physical printers. 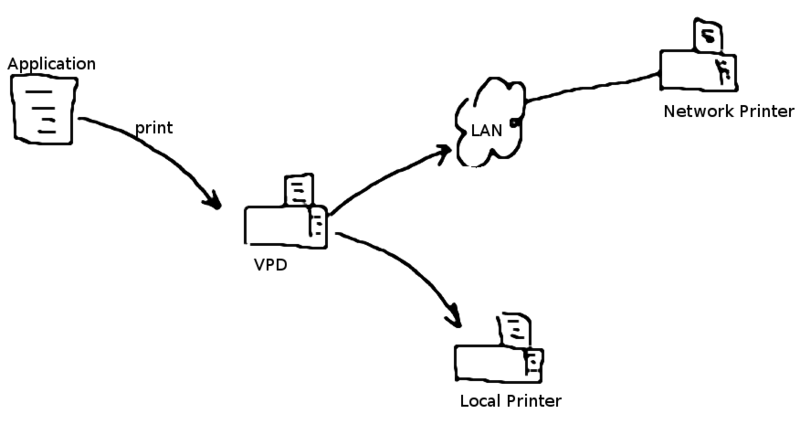 Virtual printer supports print job redirection to any available local or network printers. Print job management allows you to control the print process: who prints, what is printed; you can change printing parameters, cancel printing or save a document copy (not original). It is supposed to use the available information for print monitoring. You can modify your document: change the page content, change page order (add, delete or reorder pages). For example, you can add ancillary information such as copyright information, date and place information, etc. Or, you can delete some ancillary tags that were added by the external system during printing. Virtual printer supports watermarking feature. You can add to document textual or image watermarks. This can be your company logo, document ID, user signature and so on. Delayed uploading of documents to FTP server is supported (users need it if they work in offline mode or if they don’t have internet connection). 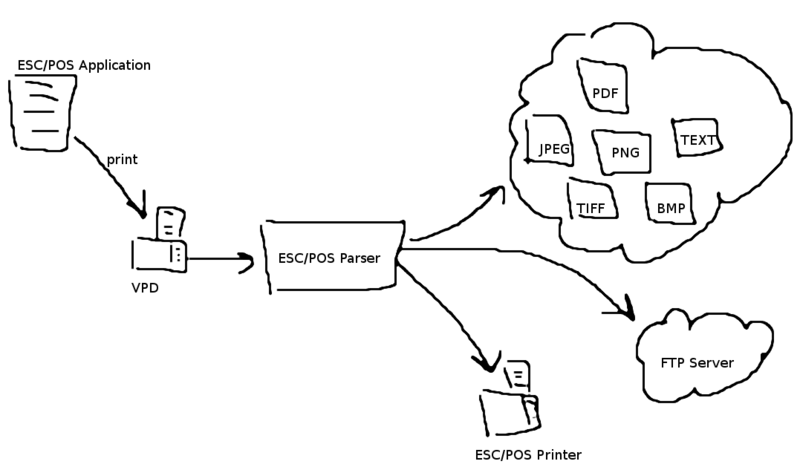 Our virtual printer can accept POS data in ESC/POS receipts. Using ESC/POS parser you can make POS analysis applications, POS backup applications and many more. ✓ Save data in TEXT, PDF, JPEG, BMP, TIFF, PNG formats on a local disk. ✓ Transfer data to FTP/SFTP server. ✓ Redirect POS receipt to ESC/POS printer. To enable “Early Access” you should add “Application/Postconverter/Early Access”, REG_DWORD value and set to “1”. 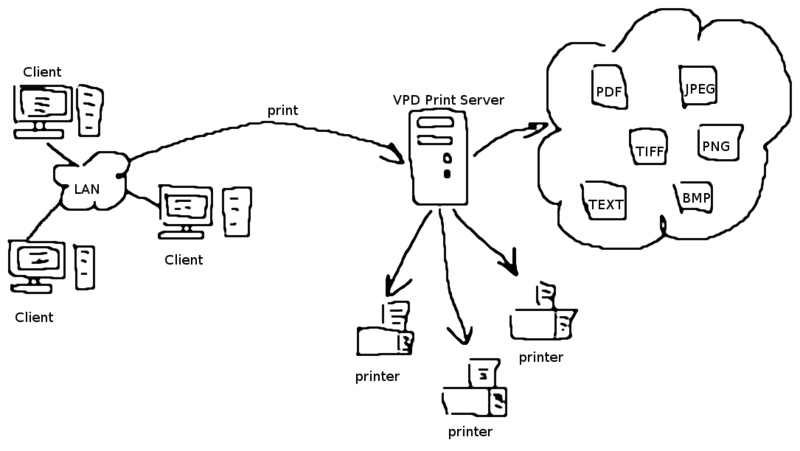 Virtual Printer Driver supports user authentication through OAuth v2.0 protocol. This feature allows to deny unauthorized access to the Virtual Printer Driver and the services provided. Before using Virtual Printer Driver each user should provide a valid credentials for authentication service. Our virtual printer uses MSI installer. We provide full source code for installer scripts so you can use them as a base for your own installers. MSI is selected because it provides centralized management functions of Windows Server OS, you can install our driver to many machines at once. 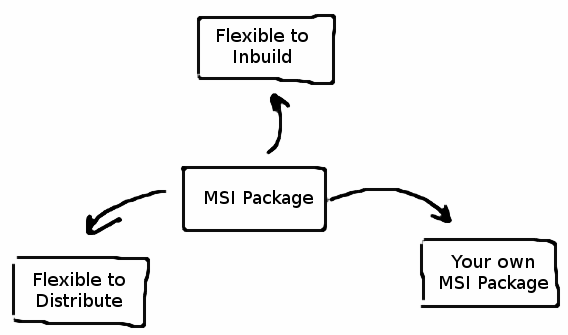 We can help you to make your own MSI installer using ours as a base. You can add custom registry keys, software launch and so on.